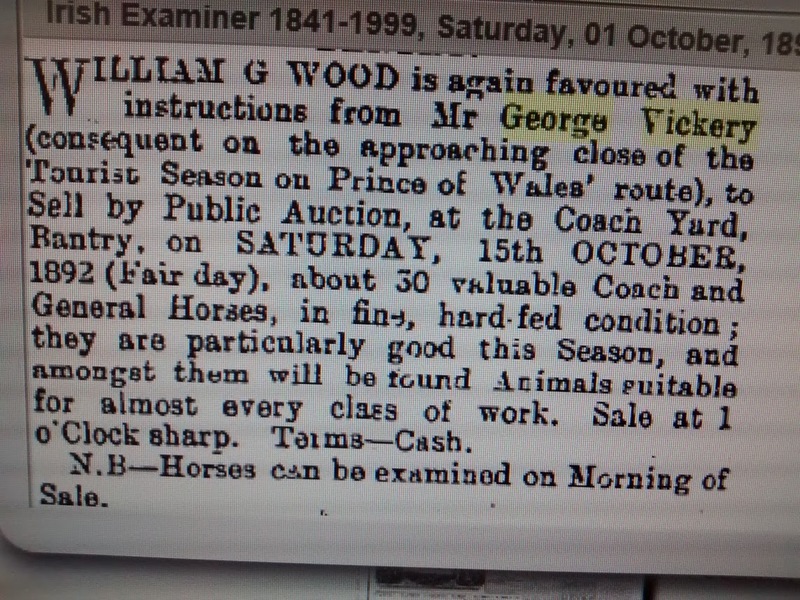 Thomas Vickery, Bantry, 1808-1883, Hotel and Transport Pioneer in Irish Tourist Industry, Winter Sale of Horses and some Vickery Genealogy. From National Library of Ireland photographic collection c 1890s. Burnt down during Troubles to prevent use by Black and Tans. Former Hotel January 2016, currently being refurbished. The legend is that the Vickery family of Co. Cork are reputed to be descended from two brothers from the West Indies who were shipwrecked in Bantry Bay in the mid-18th century. This however is unlikely as there are Vickeries in early 18th century Bantry leases suggesting they were around pre 1700. Thomas Vickery (1808-1883) was one of this family and married Mary Sullivan. He established a hotel on the site of an old dye works in Bantry c1850 and it continued in business until late 2006 when it was bought by a development consortium. During the troubles the hotel was burned down and reconstructed with the novelty of a wash hand basin in every room. In 1850 the hotel had 25 bedrooms and it was also the centre of a coaching establishment. This linked Bantry to Killarney on the emerging tourist route. Up to 100 horses were kept for this purpose. 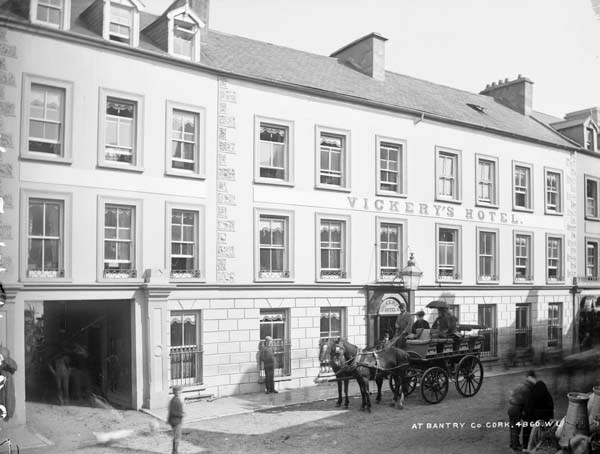 Thomas Vickery’s nephew Robert Stanley Vickery stated that his uncle with establishing his hotel and postal arrangements for the establishment of tourist did more for Bantry and its neighbourhood then the Bantry (White) family ever did. Countless people had their first training in catering and business in the hotel and in the garage business the family also ran. Many went on to found their own businesses or work in others all over Ireland and the world. Thankyou.I think some of my ancestors were drivers for this establishment.Great to see a photo.